This is our final stop of The Great Spring'tacular Link Party Parade! 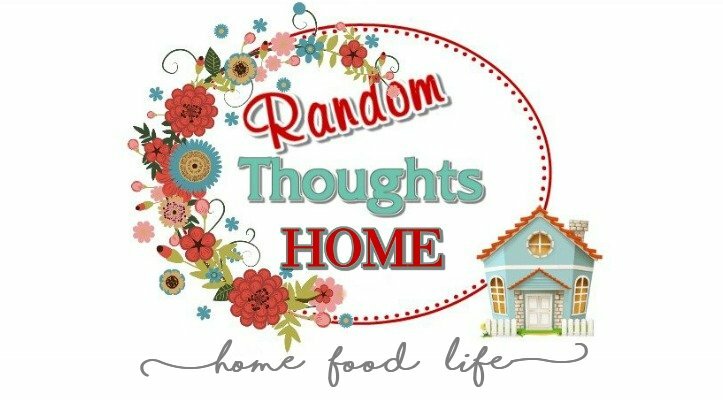 Debbie of Refresh Restyle, or Debbie Fresh as we like to call her, is hosting the Tablescape & Recipe party today and I know she is going to end our parade with a bang! The polka dotted plates are from Christmas Tree Shop, set atop my everyday white Corelle dishes. Napkins are from Bed, Bath & Beyond. Napkin Rings from Kohls, last year. Yellow flatware is by Cambridge purchased at Home Goods. Mugs and egg holders from Pier 1, last year. 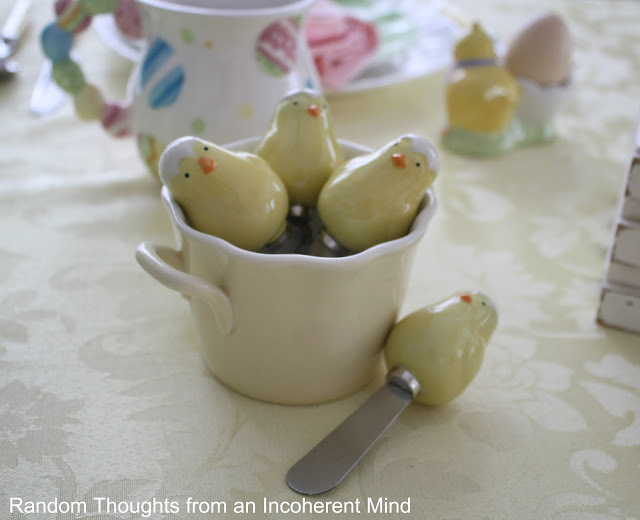 Little chick spreaders from Pier 1. Bunny candleholders, given to me by my sister-in-law, from Pier 1. 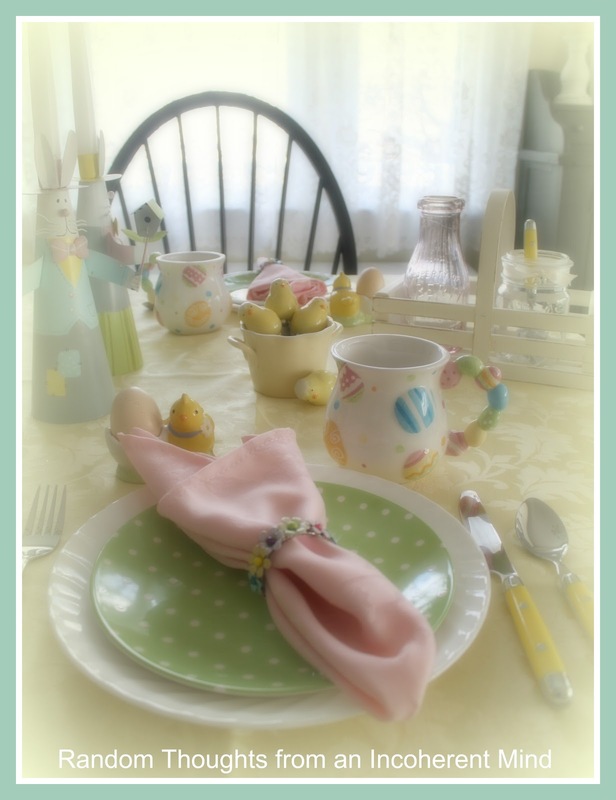 Please join me and link your Spring or Easter tablescape at ReFresh ReStyle as part of our Great Spring'tacular Party! I love tablescapes, so I can't wait to see what everyone will be sharing. 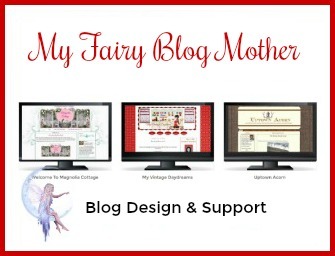 And....please don't forget, my Craft Party link is still open, if you'd like to participate! So pretty and inviting...can I stop by? Adorable holiday party! I'm your newest follower-stop by for a visit! That is so cute! I love the polka dot plates, guess who just bought a whole pile of them from the clearance! :) The spreaders, mugs and candle holders are precious! Makes me want to stuff my St. Pat's in the bin drag out Easter, but I can't! St. Pat's dinner party Sat night. But next week! I didn't know you were doing a craft party. I feel bad. Maybe I can link something up ! Gina, you have some of the cutest things! Those little spreaders are adorable! 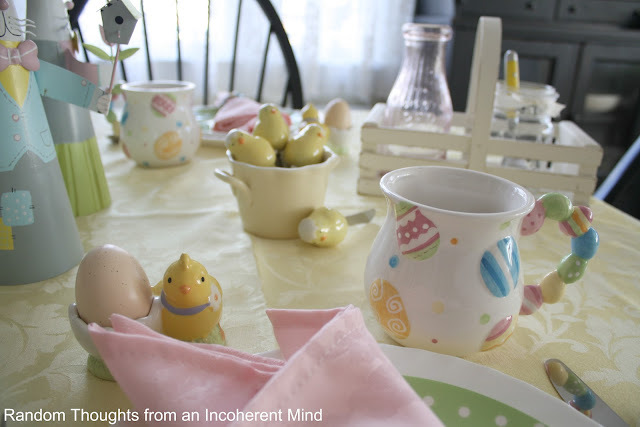 I would love to celebrate spring/Easter at this table! I had fun partying with you! SUPER CUTE!!!! 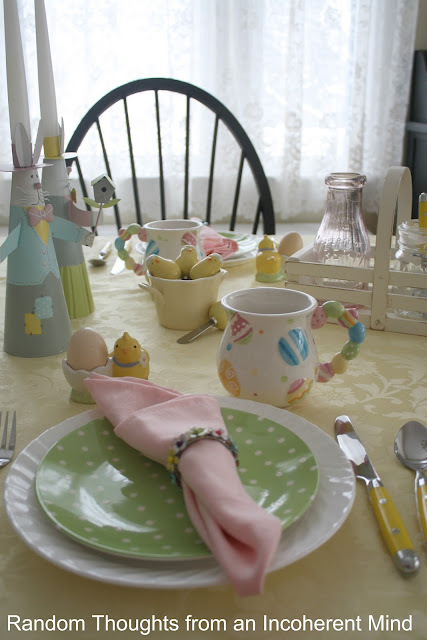 Love all the sweet Easter details on your Chick & Bunnies tablescape. Beautiful job my friend. This is soooo cute. I love your plates, the bunnies and chicks and your spring colors. Wonderful job. I am over from reFresh...just signed up to follow. come see me when you can. Gina you do the CUTEST tables. Love the napkin rings from Kohls, and those polka dot plates are too cute. Gina your table looks so sweet. Love it. This is so bright and Springy! It make me want to sit down and stay a while! Your table is precious! This is probably the cutest table ever! Adorable! What a pretty table! I adore the mugs and polka dot plates! Don't you just love the colors of spring? Donna Puls Lyninger love the green polka plates! what material are they? have a christmas tree shop nearby & was wondering? I love the green polka plates! what material are they? have a christmas tree shop nearby & was wondering? Huw do you do it coming up with such cute tablescapes...I have enough plates for oh....2 posts! Of course I am digging the polka dot plates! Very cute and definitely adorable! Those coffee cups with their colorful handles are so cute! I like those spreaders too and they look to cute in their holder! Pier 1 has some really cute things don't they! The green polka dot plates are adorable with the Easter setting! Hi Gina, Your table looks lovely, I like the Spring colors you have used. I had better check out your craft party, I love home crafts. That is just the cutesy table ever! Have a happy day! I love the spring inspiration and colors on this one. 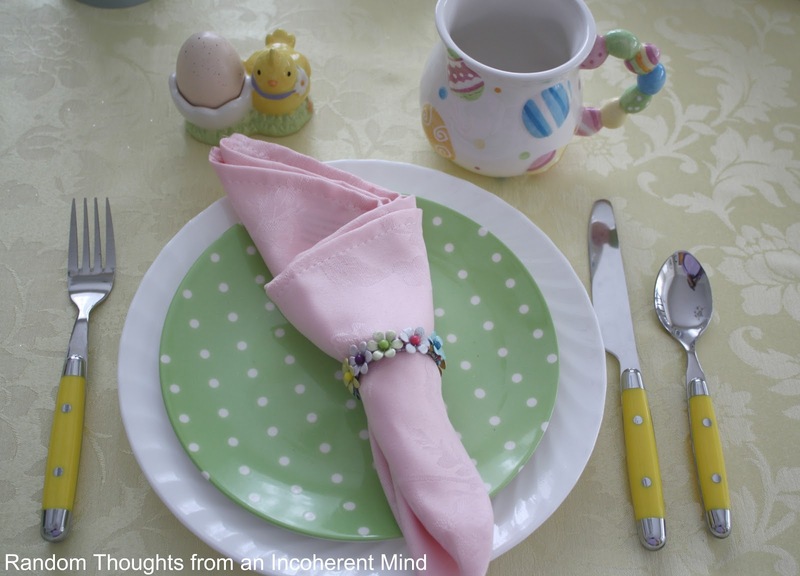 Oh my goodness, your tablescape is sooooo cute! 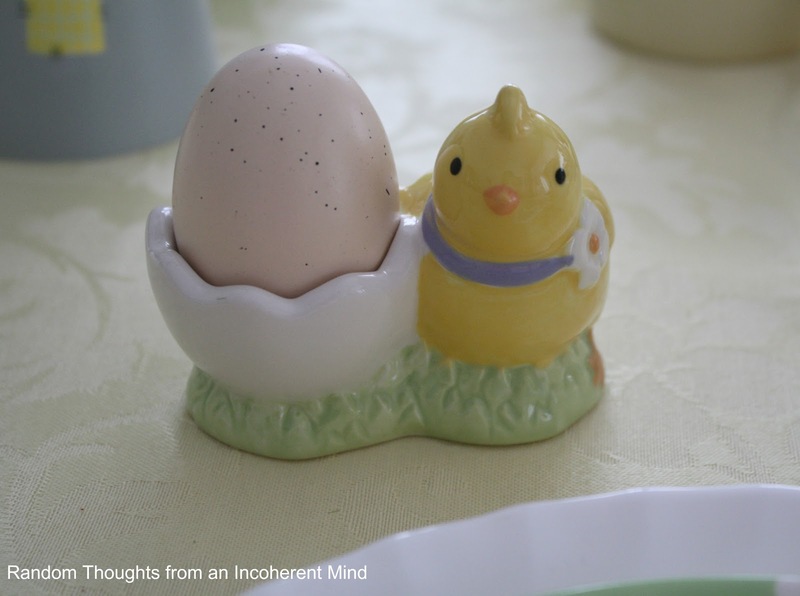 What fun Easter and spring items you've either found or been given. It screams spring and happiness! Love it!! How adorable is that! I love what you did. Pretty pretty pretty! I love those mugs, Gina! The polka dot plates go so well with them and the whole Springy look! looks just perfect!! you have a beautiful collection for Easter! OH.MY.GOODNESS! This table is absolutely spectacular!! Wow! Love it! Your table makes me smile <;) it so lively and colorful. How darling this all is. Love your Easter collections. And the wonderful soft Spring colors. So cute Gina! I love all of the little chicks. Your polka dot plate are fabulous! I have one large round one similar that I have in the center of my table. Just something about polka dots, right? Love your polka dot plates. Your tablescape is beautiful! Absolutely adorable!! 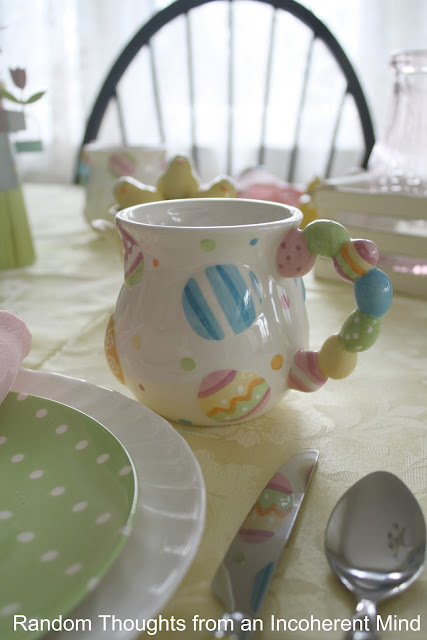 I love all of the pastel colors and your mugs are just too cute! I'm ready for spring and this looks like it really is on the horizon! i think this is one of your cutest tablescapes yet! i'd love it if you linked it up on tuesday! This absolutely the cutest table, Gina! I love it! Gina, this table is just adorable!! The Spring colors and all of the little chicks are just too cute!! This is just perfect! What a darling table Gina! I love the napkin rins, those adorable chick spreaders, the bunnies, and of course all the wonderful pastel colors. It's easy to see you're in the mood for spring! Thanks for stoppinb by my party! Awww how cute! 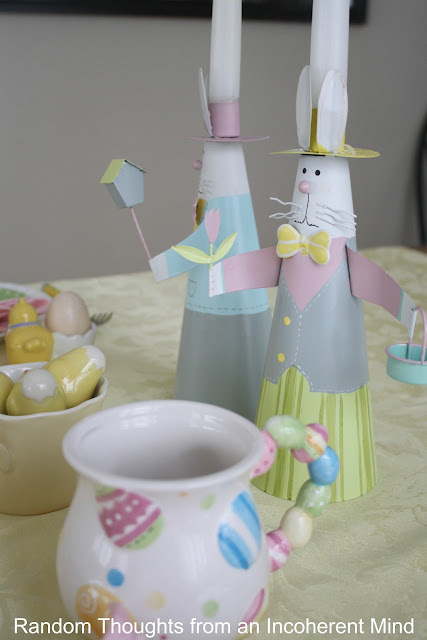 Those egg cups and spreaders are ADORABLE!!!! I want those!!!!! Soooo cute! Your table setting is adorable. I love the bunnies and chicks. Thanks for sharing. Hope you will visit Magnolia Cottage. Really cute tablescape! Love the polka dot plates and the cups! ahem... make sure you stop by my blog on tuesday. ahem.. ahem.